HE RESTORETH MY SOUL (1975). In 1961, a Christian clod named Merrill Womach survived a Thanksgiving plane accident and gas explosion that left his face and body burnt to a crisp. But instead of giving up, this fried fundamentalist sang and survived, turning tragedy into a lucrative career. 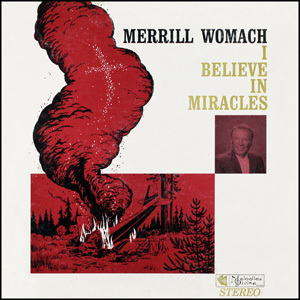 With 17 god awful gospel albums under his belt, Womach now runs a "music for funeral homes" business, and although the Lord did his/her/its damnedest to shut him up, Merrill won't be silenced. This 28-minute, unflinching, 'inspirational' portrait only reinforces God's truly sadistic nature. Womach narrates his own story, describing the pain and depression of his ordeal. 14 years later, he wanders through the woods where the crash took place, local residents describe the wreck, and his wife vividly recalls her first reaction to seeing his face ("It was like a marshmallow that had been put into a fire and left 'til it was charcoal black. "), accompanied by graphic pics and surgery footage! Merrill's heavyhanded personal insights can get annoying (and despite years of surgery, he's still a mess), but when he visits a hospital ward and burdens injured folks with his unwanted Christian singing, he goes over the line! If I was stuck in that room with this tool, I would've tossed an overflowing bedpan at his head. Sadly, the Womach family's hideous polyester wardrobe is even scarier than Merrill's burns, since their fashion sense is self-inflicted. Director Mel White obviously has a fondness for crippled-Christian projects: 1978's HE LEADETH ME was about blind singer Ken Medema, and 1972's THOUGH I WALK THROUGH THE VALLEY focused on a terminal cancer patient. Mel was also the closeted gay speechwriter for religious shitheads like Jerry Falwell and Pat Robertson, and is now best known as the father of THE SCHOOL OF ROCK scriptwriter Mike White. Meanwhile, photographer/editor Dan Dunkelberger went on to direct GOD'S PRISON GANG, hosted by Art Linklatter. All of these projects sound painful, but I doubt any of them reaches the same misguided heights, such as a huge sculpture of Christ on the cross, made from Womach's crash wreckage by a well-meaning (but obviously fucked-up) fan.